In a way, it’s also propelled by ego and the feeling that we cannot be surprised by a lot of things. Well, oops, joke’s on me. Cynicism ti lazdent. When I saw that Djaji made music, I didn’t know what to think. One thing , however, was certain – he knows music and he has good taste in music. But that also heightened my fears. Music from people who like and know music is either really good or incredibly parched – no middle grounds. The truth is, some of us actually do have a talent for and a future in music. While Djaji’s debut is by no means remotely perfect, it’s a commendable effort. While the mixing is not always the best, being a Travis Scott head, you feel the sonic experimentation with sound warping and layered voicing on some of the tracks, which saved the album from being exposed. If I had two cents, I’d bet that Djaji was as much a part of the production and mixing as Charlie X and the mixer. From the ‘Ex’ in the album title, it feels like we’re about to get some catharsis. 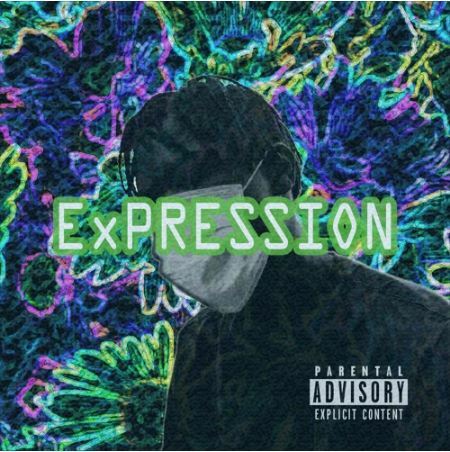 The album art of “ExPRESSION by Djaji Prime. A few weeks ago, I watched Travis $cott’s interview, pre-release of Rodeo and he talked about most of us who produce and make music started off imitating people we like till we found our path and he was right. While inspiration is needed, finding one’s artistry is major key to success. The La Flame adlibs sometimes unnecessarily drew attention away from Djaji’s artistry and what his project do on its own – sometimes, the adlibs felt too explicit and that will never be a positive. “PRELUDE: NO COMPETITION” and “HOTTEST IN THE STREET” gave the influences away too easily. Sometimes too, the flow throughout ExPRESSION roved around 2012 to 2016 – Love. Lights. Sick, Bad Mood, S**t On You and The Ends – Travis Scott. Intermittently, you want to doubt it’s Djaji on the flow as it’s simply brilliant. Other times, you linger and hope you get the flow you got on the previous track(s). I guess it’s still forgivable, being his first project, but on his second project, we won’t forgive some flows. The idea of a flow is to convey your content and intention in the most attractive way possible. Sometimes, the content is good, but the flow is just not as good. It’s why a lot of mumble rappers still get classified with the Lil Pump stereotype despite having enviable content, suited for rap music of any era. While the flow on “NO COMPETITION“, “ExPRESSION“, “LAST NIGHT“, “POT” and “I SHOT MY HEART” were heavy, a song like “SCRAP” is one of those with too playful flows, only saved by ODC‘s fire hook. “PRELUDE: NO COMPETITION” is another. On these songs, it felt like Djaji was talking, not rapping. “POT” stands out with amazing introspect and a weirdly excellent beat, but something about the song sticks out. “HOTTEST IN THE STREETS” has a dope beat and hook, but I would have preferred a more aggressive flow scheme when Djaji decided to rap. I know not all rappers will be naturally aggressive, but on Djaji’s second album, I’d love more diverse and surprising flow schemes. Though Djaji dwells majorly on the beauty of familiar introspect, the album introduces a unique way of his idea, though the boisterous nature of “HOTTEST IN THE STREETS” is unnecessary . Sometimes, give them what feels true to you, give fans not what they want to hear. The song seemed corny and cliche, but will make a good single, however. Djaji makes music that could truly garner a cult following. It’s not remotely bad for a maiden effort. The segue from “MUMU” and “PARANOID” shows the power of thought of the conversational coherence that almost seems excessive at times, but good songs and progression, regardless. The album starts off with four or five straight heat tracks, but falls off slightly around “SCRAP” and “AM I WRONG?” which have a tendency to bore you. In the end, ExPRESSION is something more off the Kid Cudi alley – flow sometimes bores you if you aren’t listening to the stories being told. As an output, it feels like “A Kid Named Cudi,” laced with stories unique to Djaji. While this project chronicles the beauty of honesty on wax, telling stories of psychedelia inducement, coexisting with excessive dwelling on failed – romantic and personal – relationships which Djaji finally damns to hell on “LAST NIGHT, I SHOT MY HEART,” one questions the lack of topical diversity. It’s by no means excellent, and it sometimes unnecessarily and regularly focuses on distress of drugs and women at inopportune times – one feels Djaji has more to say, but is only telling is what he feels we want to hear. I didn’t expect to like this project, but I love it. I’m a production-head and if anything is excellent on this project, it’s the production; near pristine. That said, this is a project that will age way better than any of us could have hope – including Djaji himself. The reason is simple; the rules of excellent music making is slowly gearing towards how enjoyable a project is and this project is definitely enjoyable if you listen like a fan, and not a critic – It’s obvious that time and effort went into it. The music is in Djaji and I found myself asking, ‘Why did he wait this long to drop something?’ as I await his next project – not just for the music, but for what his evolution births. I’d definitely want more crisp flows on the next project. But Djaji is so adaptable to both singing and rapping that I might again forgive the shortcomings. P.S: Nigerian rappers should feature Djaji this year, he’d give you a third verse and blood-dripping hooks. He killed all the hooks he did by himself. All the features on ExPRESSION also slayed their jobs. It shows Djaji knows talent just as he knows beats and sound.